When I unexpectedly fractured my wrist, of course I immediately went into healer mode and started a regime to promote bone growth and healing and to reduce local inflammation caused by the trauma. Even if you don't have a broken bone (which I hope you never do! 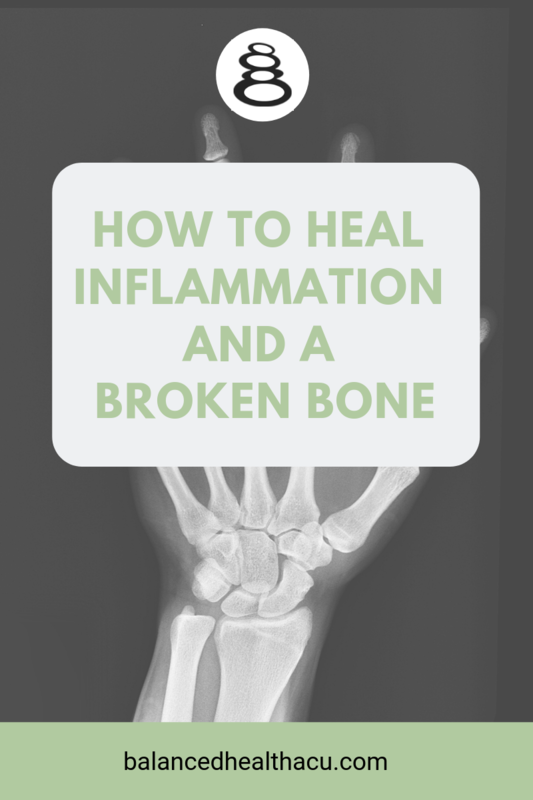 ), these pointers can help you strengthen your bones and combat any inflammation in your body due to injury, trauma or overuse. Recovery from an injury does take time (and patience!) but I truly believe that I have recovered faster because I was proactive from the start. To reduce the swelling and inflammation, I also took a tumeric supplement daily. I also elevated my arm whenever possible to help my lymph system drain to reduce swelling and moved my fingers throughout the day to improve circulation. Zheng Gu Shui: This is a topical Chinese herbal liniment that I rubbed directly into my wrist and forearm to promote blood circulation, to disperse blood stasis, to relax tendons and muscles, and to reduce swelling and pain. Arnica gel: I used this homeopathic topical gel to heal the deep bruise on my forearm. Heating pad: I used heat A LOT in my recovery to increase healthy blood flow to the area to promote healing, to reduce swelling and pain and to warm up my muscles before stretching to increase my range of motion. Water: Making sure I drank enough water each day became a focus to remove toxins, reduce swelling and help circulation. Epsom salt soaks: I took frequent baths with epsom salts to soak my arm so that the warm water could help with circulation and blood flow. The magnesium in the epsom salts also helped reduce muscle tension and ligament tightness. Massage: In addition to physical therapy, I turned to my orthopedic massage therapist to help increase my range of motion. Unlike PT, he brought a larger view to my healing, working on my shoulder, triceps and other peripheral muscles that were holding tension and limiting my wrist movement as well as helping to mobilize all the carpal bones that had become "stuck" as a result of the cast. Acupuncture: Of course I turned to acupuncture as well as my go-to healing method, treating my wrist and arm on an almost daily basis. The acupuncture helped to reduce the pain and swelling as well as improve blood flow and circulation to heal the bone, muscles, tendons and ligaments. So as you can see, it was a full on effort (and continues to be) to recover from my fractured wrist. But, if you put in the time and effort, you do reap the rewards.